According to information provided at nciia.org, National Inventors Month is the extended celebration of American invention and creativity. 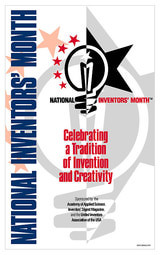 National Inventors Month which used to be held in August is now being held in May. The senate had agreed to the switch after appeals made by Edison Nation and Inventors Digest, supporters and founders of National Inventors Month. August traditionally has been National Inventors Month. The move to May better aligns with the academic calendar, explained Inventors Digest Editor Mike Drummond. But, whether it’s May or August, ideas can be celebrated any time: whether they come as humorous thoughts about life as someone sees it (fromthemopbucket.com) or, as ways to make life easier and even complex schemes that don’t end well, an idea goes from conception to completion by putting forth the effort to see it through. For proof, we have Perky. Rumor has it, Perky’s intended to sell the machines but soon discovered the cereal biscuits were more popular than the machines. Talk about serious idea development. 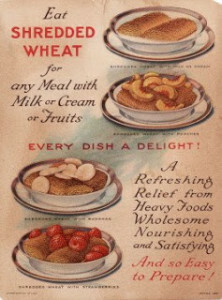 These days, cereal lovers can celebrate and stroll down any cereal isle to likely find at least eight varieties of the shredded stuff from mini to frosted minis. Not fond of being so fiber conscious? That’s ok.
For everyone else there’s still bacon, sausage, pancakes and more –no ideas required. Find out more about the phrase “a day late and a dollar short” and more at wisegeek.org. Got ideas? Check out inventorsdigest.com or invention-help.com. Want to patent one? (of those great ideas) go to uspto.gov. Celebrate inventions every day –but don’t forget to do it May too.